What does a daily schedule for my dog look like? For boarding guests, up at 7am for breakfast and potty break, then out to one of our play yards for fun with their pals until about 11am, nap time until about 4pm, then up for dinner and another long romp in the play yard before bed time. For Daycare guests, a full day of play time in one of our play yards with their furry friends! Yes, highly recommended to keep your pet’s digestive system regular and to keep them on a stable diet. Please mark all your food and any bags you bring with your pet’s name. Only bring enough for the duration of the visit please but if you have a dog, add about 50% more food as your dog’s appetite may be greater with all the exercise it will get here at The Pet Resorts – Dunwoody. Sure do! The Pet Resorts offers a 20% boarding discount for multiple pets from the same family starting with your second pet. We also offer additional discounts for our Doggie Daycare packages and long term boarding discounts. 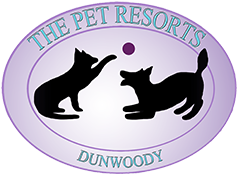 What makes The Pet Resorts – Dunwoody different?